Founder Institute Mentors provide the support, feedback, and guidance that helped our early-stage founders launch over 800 businesses since the Institute was founded in 2009. When a founder is in need they come to the rescue... sort of like Startup Superheroes. While all of our 2500+ Mentors help our companies, among these great individuals, there are some that stand out. Earlier this year, we announced the nominees for the 2012 Mentor Awards, which will take place at the 14th Founder Showcase event, on Wednesday, July 17th in Silicon Valley. A serial entrepreneur, Joe has been involved in the startup and growth of over 20 companies in industries ranging from IT and consumer goods to lead generation and motorsports. He is author of the book Entrepreneurial DNA: The Breakthrough Discovery That Aligns Your Business to Your Unique Strengths (McGraw Hill 2011). He has been featured on FoxNews, CBS, NBC, CNN, ABC, WGN and numerous nationally syndicated radio shows on topics related to entrepreneurship and small business growth. 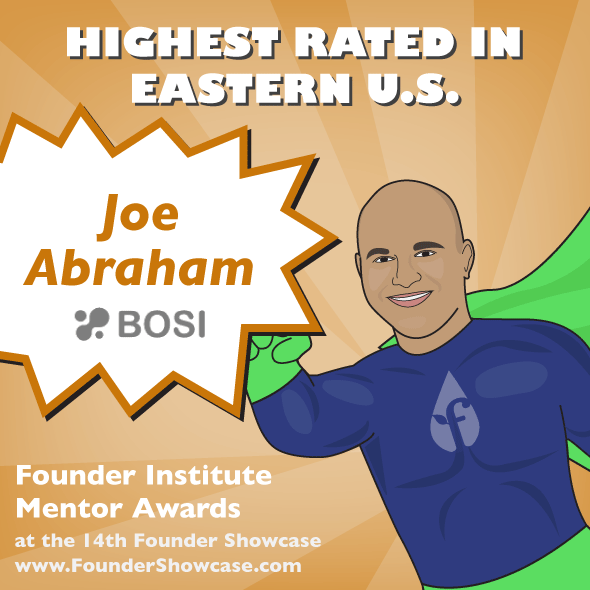 A keynote speaker at the 14th Founder Showcase, Joe's 'Founder Matching' Workshop will explain how to decode someone’s entrepreneurial DNA to find the ideal co-founder match. Get your tickets today. The 2012 Startup Mentor Awards will be handed out at the Founder Showcase event, on Wednesday, July 17th, 2013. In addition to the award ceremony, the event will feature a series of early-stage startup workshops, led by Phil Libin (CEO of Evernote), Nir Eyal (Acclaimed Author and Speaker), and Joe Abraham (CEO & Founder, BOSI Global), as well as a pitch competition between six promising companies. We hope you will join us!